Mom, can we have cookies for breakfast? ….. Yes! I am sure as a parent you have heard this question before. Cookies for breakfast? No WAY! 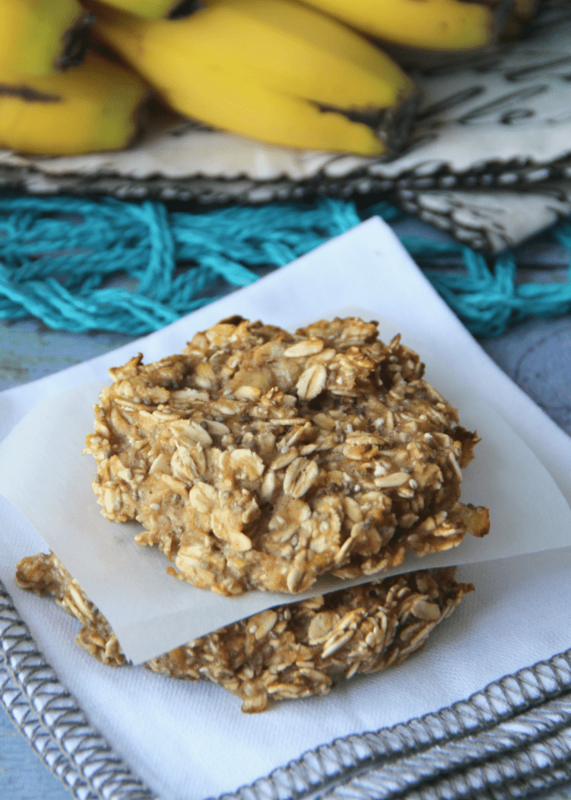 Well, with these Healthy Oatmeal Breakfast Cookies, you can eat cookies for breakfast, lunch or dinner! I keep a batch of these cookies on hand during the week for snacks, quick grab-n-go breakfasts, or for a pre-workout snack. The best part? There are only 5 ingredients! Bake approx. 25 - 30 minutes, or until golden. Remove from oven & let rest on cookie sheet for 5 minutes and then move to cooling rack. Be careful, cookies will be very soft until they cool entirely. 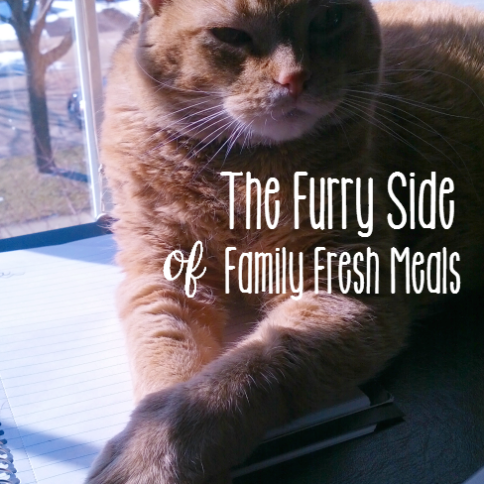 Do you love Family Fresh Meals? Never miss out on FUN new meals or Lunchbox Idea for the Family and SIGN UP to have my posts sent right to your inbox! It’s EASY PEASY! Just CLICK HERE and enter your email! These look delicious! Need more healthy options for my little guy. Thank you! Are you able to use regular oats as opposed to the quick cooking kind? I think regular oats should be fine. Steel cut oats will not work for these those….so steer clear of those kinds. Would love to try but my kids are allergic to bananas. Any ideas if the cookies would hold together if I omitted this ingredient? Oh dear.. I don’t! I’m sorry Erica. Can anyone else help out this this? What about substituting coconut oil? Mine came out a little rubbery. Do you think they needed to bake a little longer? My wife said it might be that I pressed down too much on them making them round. I do think a little more cinnamon and some honey would be good. We added Craisins and walnuts. Yes sweetening them up is yummy! This recipe is just for the basic version and I do suggest add-ins. And your choice of craisins and walnuts sounds delish! If they were rubbery, you might have cooked them a little long? We started out with just 25 minutes, so it does not seem long. The next batch we went to 30 minutes and they seemed a little better. I switched to a mix of Quick Oats and Old-Fashioned Oats and slightly increased the amount of oats. My family hates the taste of apples except as plain old off the tree apples. What can I use to substitute? Would sweet potatoes work? Pumpkin? Just made these, they are great! Thanks for the recipe!!! Nice to have a cookie now and again and it not be loaded with sugar. 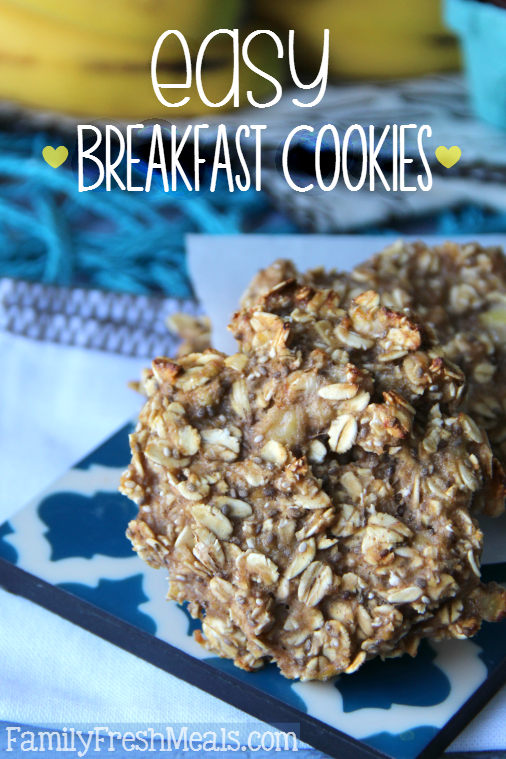 My family was getting soooooo sick of our almost daily slow cooker overnight oatmeal……and then I discovered your VERY healthy and tasty breakfast oatmeal cookies! My 9 year old daughter and I bake 4-5 batches Sunday afternoon. 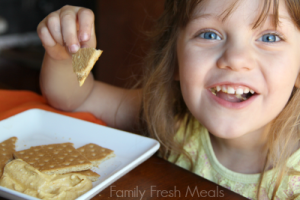 Now our daily before school breakfasts are celebrated, easy and fast, and still healthy! My 9 year old has come up with all different flavor combinations…….dried peach and pistachio, peanut butter, citrus (orange zest) cranberries, apple brown sugar, blueberry cobbler, cranberry pumpkin, rocky road, apricot and pecan, raspberry almonds, and carrot cake….all variations from your original recipe. She has an Invention Convention at school and was hoping to make a children’s cookbook using all the variations for these breakfast cookies. We wanted to know if it would be OK for us to re-print your original recipe, with you given credit and your web page cited. Again this is just for a small 3rd grade project and won’t be distributed. We understand if you would feel uncomfortable with this request…..and either way, we want you to know how much we LOVE this recipe…..easy for young kids to help bake, nutritious, quick for busy mornings, AND yummy! And we’ve had so much fun experimenting with flavors! Thank you for sharing it with us all!!! Awesome!! ❤ your reply inspired me to try various options down the road! I made these cookies. They came out looking wonderful however they tasted horrible. I followed the recipe exactly I put in a little bit honey to sweeten and nobody in my household would eat them they said they just did not taste very good. Sorry you didn’t like them Kimba. They are a “healthy” cookie, so they aren’t going to taste as great as a regular cookie would. Maybe try some add-ins next time to enhance the flavor? I use this site all the time. Could you do this with aluminum foil cups in a muffin pan? I’ve never tried that before Tiffany, so I can’t say for sure. Would like to freeze a bunch. How long would you recommend freezing them for? How long do you think you can you freeze them for until they go bad? Just made these this morning after a friend’s recommendation. I think they’re great and my kids (2 1/2 and 11 months) gobbled them up. I love that they aren’t as messy as regular oatmeal. My husband thought they needed to be sweeter but he’s a sugar junkie. I’m thinking of trying peanut butter in them but am wondering, if anything, what should I sub out? Any ideas? To make them more sweet, you can add in some more honey, toasted coconut, chocolate or white chocolate chips 🙂 YUM! I’m making the original recipe first, but I think cooked mashed carrots might be a good substitute for those who want/need to avoid bananas. I’ll try that next and let you know if it works. I just made these with a few of my own tweaks and they are very good! 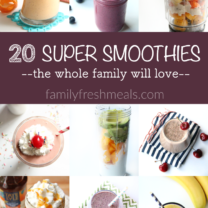 -I added some ground flax seed and also a bit of powdered baby formula just so they had even more health benefits(-I’m weaning an 11 month old baby…). I also added about 1/4 cup of honey, and I was out of cinnamon so I used ground earl grey tea for flavour. Also added about 2 tablespoons of oil. Really good, mine took about 23 minutes. I made them late at night with a bit of a swert craving so I’m currently eating them with a bit of icing, but in the morning will eat them as is. I’m really hoping my little guy will like them! Hi what if I don’t have applesauce ? Can I add coconut ? Hi and thank you for the recipe. I had 3 bananas and calculated accordingly to match the recipe. I used half quick oats and half regular, I put in 3 TBS of maple syrup and 1/2 cup of chocolate chips. I used a 1/4 cup scoop to measure cookies and it made exactly 2 dozen. They were very tasty, not too sweet and everyone in the family enjoyed them (including my sugar addict 4 year old). I made these last night and they came out so yummy! I can’t wait for my kids to try them! My 13 yo son doesn’t like to eat anything till about 1/2 o’clock so I’m always looking for something to entice him to eat breakfast. Can’t wait to make these. I’ve been looking for another breakfast cookie recipe (lost the old one) although I know that one used crushed pineapple (might be a good- and sweeter- banana substitute if drained a bit). Anyways, I always eat breakfast cookies crumbled up and with yogurt on the side as a dip. Delish! I thought that these would be amazing for my diet, but I threw mine out as soon as I tasted them. The banana just overpowers everything else. I felt like I was eating some bastardization of banana bread that was worse than the original. Thanks, but no thanks. I am so sorry you didn’t love these Joy. 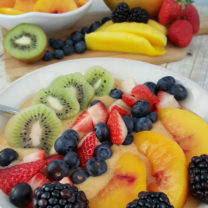 Maybe you could go lighter on the banana and use unsweetened apple sauce. These are SOO dietic, perfect for my “get tiny challenge” Facebook group. 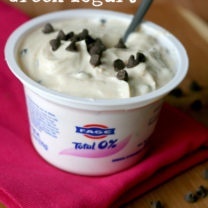 I love the way they taste— lightly sweetened, chewy, soft, just overall a great wholesome snack for the chronic dieter. MINT CHOC CHIP — I added chocolate chunks, peppermint extract and a bit of spirurlina for the green color. We tried these for the first time today, and we included the optional additions of chocolate chips and honey, and they were simply delicious! They are so easy, and we will definitely be making them again!